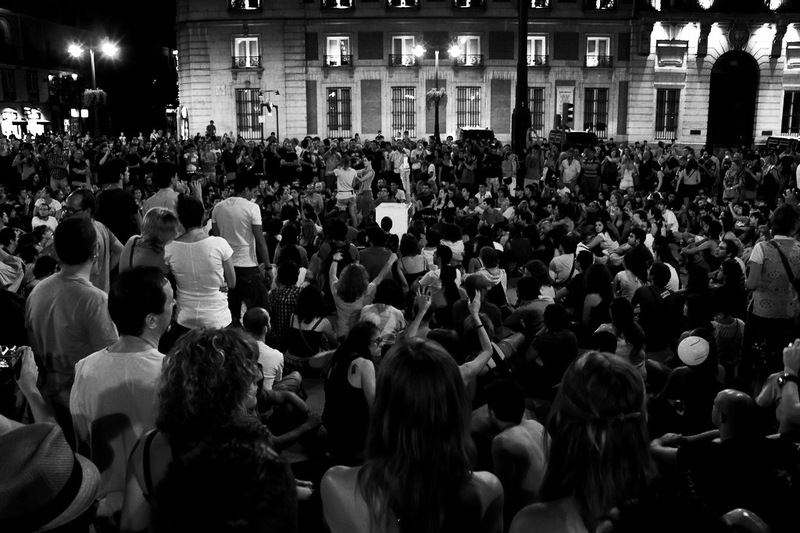 Image: Puerta del Sol, Madrid, Spain in August 2011. + A student drops out of high school in Baltimore City. + The activists of the Democracia Real Ya movement in Spain demand change to the economic system that created a national crisis. + Manoubia Bouazizi tells the story of how her son, Mohamed Bouazizi, sparked the Arab Spring by setting himself on fire in Tunisia after his vender cart was confiscated by local officials. The difference between the teacher's intensions and how her words were received by the student. How the Spanish protesters view themselves and who they view as their audience. What pushed Mohamed Bouazizi to set himself on fire. What dignity means to each of the characters. Fictional story by Max Ferency loosely based on a real student in Baltimore City.